The Horner School, Horner and Graves's School, and Horner Military Academy were a few of the names given to the secondary school established by James Hunter Horner and his family members over the course of their long teaching careers. An 1844 graduate of the University of North Carolina in Chapel Hill, Horner taught at Hillsborough Academy and Oxford Male Academy before establishing his own Oxford Classical and Mathematical School on the outskirts of Oxford (Granville County) in 1855. The school offered two 20-week sessions a year for $95 a session. The boys were housed in a series of two-room cabins placed along the edge of the Horner homestead. During the early years of the Civil War, the school closed when Horner served as captain of Company E of the 23rd North Carolina Regiment. In 1863 ill health returned him to civilian life and teaching. In 1873 he took as a partner Ralph H. Graves Sr., another noted teacher, and they were persuaded to move their school to Hillsborough to occupy the impressive brick facilities built in 1860 for Hillsborough Military Academy. The Horner and Graves's School opened in Hillsborough in January 1874. Its letterhead described it as a "Classical, Mathematical, Scientific and Military Academy," but an advertisement of its courses makes no mention of military instruction. In 1875 the partnership between Horner and Graves was dissolved, probably because of Horner's illness; he spent months of 1876 and 1877 in the Insane Asylum of North Carolina. Horner recovered from what was probably a nervous breakdown and taught a few classes each year until his death in 1892. Meanwhile, aided by Hugh Morson, Graves continued the school in Hillsborough until his death late in the spring of 1876. The buildings of the Horner School in Oxford were occupied by another professional schoolteacher, Fred A. Fetter, during 1874. But James Hunter Horner's family moved back to Oxford, and the Horner School was reestablished there in 1876. It was operated by Thomas J. Horner (a younger brother of James Hunter Horner), Robert H. Marsh, and John Martin. In the spring of 1877 Junius M. Horner, son of Thomas Horner and a future bishop of the Episcopal Church, continued his father's school with the assistance of Frank R. Underwood. In the fall of that year, Jerome C. Horner, an older brother of Junius, took the helm. Having decided to turn the classical academy into a military academy, Jerome Horner spent 1879 teaching at Cape Fear Military Academy in Wilmington. On his return to Oxford, he built barracks and a large schoolroom on the property and instituted a military program in the 1880 school year. The Horner Military School continued at Oxford with great success for the next 33 years. When new barracks, built in 1891, were destroyed by fire in 1913, several cities offered Jerome Horner attractive accommodations and promises of support. He chose Charlotte in which to rebuild the institution. 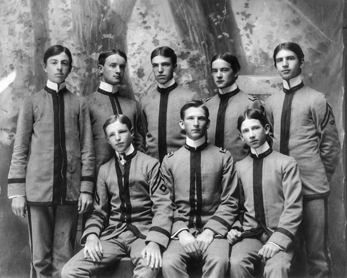 The Horner Military Institute operated in the Myers Park suburb from the fall of 1914 until the spring of 1920. The need for city expansion is said to have doomed it. The aging Jerome Horner felt unequal to building up a school on a new campus. Although he continued to teach in other schools for three more years, the Horner School officially closed in 1920. Horner Military School search results. North Carolina Yearbooks. DigitalNC. http://library.digitalnc.org/cdm/search/collection/yearbooks/searchterm/Horner%20Military%20School/field/all/mode/exact/conn/and/order/date (accessed October 18, 2013). Members of the class of 1900 at the Horner School in Oxford. North Carolina Collection, University of North Carolina at Chapel Hill Library. Trying to find any information about my grandfather Gordon Smith, who was born in 1888, age 12 in 1900. I recently discovered that he went to Horner Military Academy. Seeking info about his time there. He grew up in Raleigh, went to NC State after Horner. His entire career was in the military. Thanks for any help you can offer. Thank you for visiting NCpedia and for taking time to share your history and question. I am connecting by email with the Government & Heritage Library at the State Library of NC. Recently found a button from Horner School. The backmark is Pettibone Mfg. Co. Which makes it a post war button. It should date 1873-74 period . Would like to see the enrollment records to see if I can put a name to it. It was found at an very old home in Washington Co.